Greetings team, and welcome to March’s edition of my 2018 reading updates. Thanks to my commute and the snowy weather I’ve read a lot of books this month – ten to be precise. And they’ve all been good. There have been tales of great explorers and young girls lost in this crazy world. Plus assassins and murderous nannies. What a great mix, right?! Read on to see what I thought of my March reads. This is a lovely book about a young girl dealing with the loss of her parents and grandfather and also her youngest sister’s fantastical imagining’s. It’s also about growing up and balancing first love and friendship with embarrassing family and doing what must be done. There’s something so special about David Almond’s writing and his latest novel is no different. It’s a beautiful look at the wonder of this world and dealing with loss. All wrapped up in a tale of a young boy trying to discover who killed a gang member. It’s lovely. I’m a massive Louise O’Neill fan so when her first adult book was thrust into my hands a month or so ago I was very happy. So happy in fact that I pretty much cancelled all plans for 24 hours and got reading. And guys, it was good. It’s an honest and unflinching look at one women’s relationship with an older, richer man who wants to keep their relationship secret. He uses her when he wants, is awful to her and the relationship is clearly abusive – both mentally and physically. So you’re of course rooting for her in the hope that she realises what he’s doing to her is wrong and that she finally walks away for good. Unfortunately she can’t and is too hung up on him – jeopardising her new relationship and being destructive with her friends and family. The characters are all unlikeable, their decisions ridiculous and awful and yet the book is still incredible. It’s engrossing and frustrating, brilliantly written and heartbreaking. I loved this book. It started as a normal teen read about first love and forging your own path while dealing with parents who want something totally different for you. With characters that I could identify with and who were just normal kids – not up themselves or annoying at all. And then a terrorist attack happened in the town where the book is set, and Mia, who happens to be Muslim and have the same surname as the attacker, is suddenly viewed as someone other than just a normal teen. She becomes a target for prejudice and her parents become even stricter and harder on her. Will she have the strength to decide her own future or will fear of disappointing her family stop her from doing what she wants? I really enjoyed how the book morphed into a different book, one that looked at wider issues and prejudices and asked important questions. I think that’s important. Definitely a good read and one I’d recommend to others. I loved this book. It’s a magical adventure following one girl’s polar adventure. She’s joined by a rag-tag band of friends who are with her when they become separated by the adults and ‘real’ explorers. The book has everything you want in a brilliant adventure tale, including unicorns, snow princess and savage attacking cabbages. Yes really! It’s so incredible and just a fab read – no matter your age you’ll love it. I love Sarah’s writing – it is so beautiful and emotional – and her latest, a book written with Brian Conaghan, where they write a chapter apiece, is no different. Nico and Jess are two troubled teenagers who meet and form a connection. Nico has recently emigrated from Poland and Jess is struggling with the violence happening at home. They meet and friendship becomes love, but is that enough for them to deal with what’s happening in their lives? You have to read it to find out – it’s brilliant, thought-provoking and stunningly written and it doesn’t end how you think. But it does end perfectly. Both my sisters have been trying to get me to read this book for ages but I’ve just had so much already on my TBR pile that’s just come first. But now that I’ve finally read it I can see why they pushed it so hard! It’s such a good read. It’s centered on a government trained assassin who’s left behind that world to become a saviour to those in need. He keeps to himself and doesn’t have friends or make relationships until one day he gets a call for help and things spiral out of control. He’s shot at and pursued and his entire world is threatened. This book is good. It’s like all the best spy novels and features a brilliant hero that you can’t help but root for. Oh and it’s a fast-paced page-turner of a book. I’ve been waiting to read Spark the follow-up to Alice Broadway’s incredible Ink for close to two years after reading Ink on submission at my old job. And thankfully this book did not disappoint. Spark is phenomenal. It’s a brilliant book about secrets, lies, fairy tales and learning to think for yourself and question what everyone’s telling you. It’s absolutely astonishingly excellent. This book opens with the words: The baby is dead. It only took a few seconds and from those words I was hooked. This is the tale of one family and what happens when they hire a nanny. A nanny that’s brilliant with the kids and becomes part of the family. Before taking part in a heinous crime. So not an easy read but a really good one. I devoured this book in 24 hours and would definitely recommend it. It lost a little of its brilliance at the end as the last few pages felt rushed, especially after so much build up to the crux of the book. But that didn’t ruin it. It’s just something worth knowing before you start I think. This is an incredible book – a page-turner of a read focused on addiction. It follows Lexi who gets taken to rehab by her brother after overdosing. There she meets other addicts and learns that she’s just like them – an addict, beholden to the drugs she takes. While in rehab she examines why and how she has become addicted it’s a no holds barred look at that side of things. Lexi is a flawed and often times spoiled girl, but you can’t help but support her thanks to Juno’s incredible writing. I adored this book. 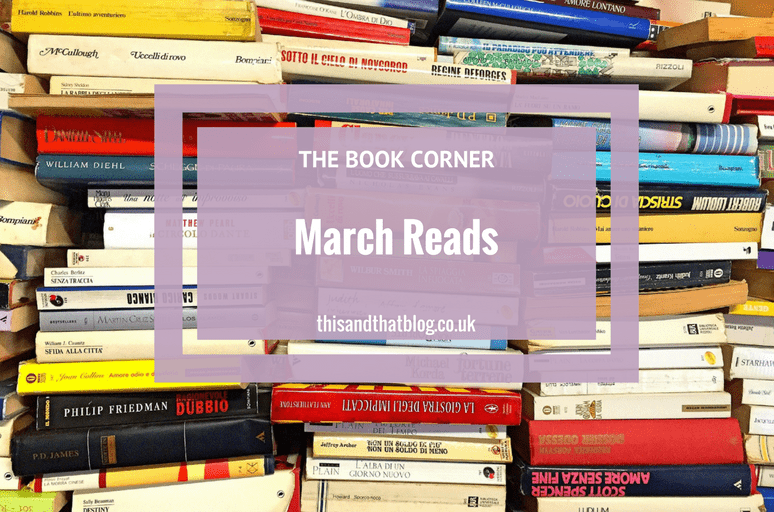 So there we have it, my March reads – and so many brilliant books. I’d be hard pushed to choose a favourite, which is always a good thing! Tell me, have you read any of them? And if so, what did you think of them, any favourites?